measures 11x14 each and issued as a set of 8. 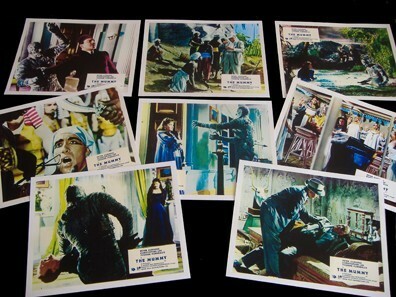 NOTICE: our sample is actually the identical licensed Hammer reproductions until we can get an image of the original set. NOTICE: There are licensed by Hammer reproductions of this British lobby card set on the market. These are identical in every detail to the original release. PostersandStuff.co.uk have their stamp on the set. For more information on this release, see our article on Hammer Reproductions .